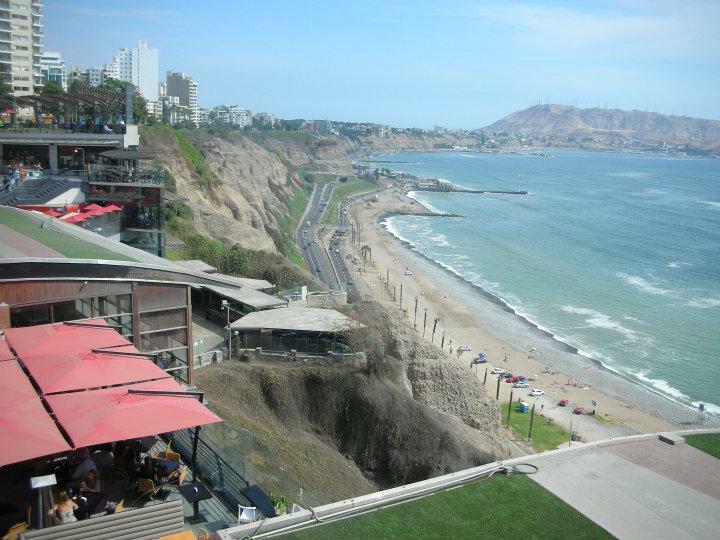 Lima, Peru - January 28, 2015 - Blog from Lima, Peru | South America!! Just as we arrived at the Buenos Aires International airport this morning at 6 am, a thunderstorm erupted. It was the first real rain we have seen on our trip. The storm was still in the area when our plane departed, and it made the first hour of our flight very rough, very rough indeed. Those of you who truly know Stan and his love of flying can appreciate the strange expression his face forms and his slapping and grabbing the arm of the seat every time the plane makes a bobble. Poor Stan! But big guy that he is, he was brave. I was proud of him! But he did make me giggle a little. All the passengers must have remained nervous through the flight too because they all applauded when we touched ground in Lima 5 hours later. As we were landing in Lima we could see the landscape below. As is the case with most airports, the Lima airport is located in an industrial area of the city so there were plenty of dusty looking buildings below. Even the streets between the buildings appeared to have a thick layer of dust. But the terrain around was most intriguing. It was unlike any land I´ve seen before. There were rock formations and unlike the golden grounds of the US desert southwest, the soil below was dark-colored desert . There was no plant life at all, no cactus, no scrub pines or eucalyptus, no mesquite or sage. There was nothing . . . just dirt and rock. All my mind could conceive is that this must be something like a lunar landscape. We learned from our driver, Deborah that all plant life here in Lima must be irrigated in order to live. Water for the city is provided by nearby rivers fed from the mountains, and fresh produce is grown locally in the desert with huge drip irrigation systems. The tropical fruit comes from the jungles. The air here feels fantastic. It makes me think of the Mediterranean. The sun is warm and the breeze has a slight chill in it. Quite a change from the sweltering heat we have enjoyed thus far in Brazil and Argentina. But the sky was not a clear blue; it seldom is. The sky was and often is hazy with the air pollution created by the 10 million people who live and work in this city. We spent the afternoon exploring and enjoying a nice lunch of salmon and salad. Everyone knows I love primitive markets. We walked to Mercado #1 which is a massive market featuring household goods and individual stands of fruit, vegetables, and meats of all kinds including chickens and ducks with feet and heads still on and rows of fresh fish. Our driver told us there was a little-known shop in there owned by a former chef that offers the very best ceviche in the area. Boy, did that sound good!! As Deborah told us about it, our mouths watered. We found that booth in the Mercado #1, but it was closed. Cerrado! I have to say, I think Stan and I both were relieved. It sat right between the "chicken and ducks with heads and feet-on" place and the fresh fish place. Need I try to describe the aroma? We still want ceviche but are thinking we will probably go to one of those over-rated, commercial restaurants and gladly pay three prices for it. We changed some American dollars into Peruvian Nuevos Soles--we got about 3 to 1. Just as an interesting note, the exchange rate in Argentina was 8.5 Pesos to the dollar, and in Brazil, it was 8 Rias to one. We will be dealing in Soles for the next week. While we were out, we walked from our hotel, Hotel Carmen, to the coast, following Avenue Jose Larco. At the cliffs above the beach, we found the famous shopping mall, The Galleria, built into the cliffs overlooking the Pacific. Nearby we found seats in a city park on top of the cliffs and watched shoppers below us. We also watched in amazement the paragliders who soared in front of us doing turns and near-flips powered only by thermals. It was a fantastic show. Some good news, here in Peru we also arrived back in Eastern Standard Time, thankfully., but we had a 5:30 am pick-up this morning, so now, even though our clock says it is only 6:45 pm, it feels like 8:45 pm. We are drained from our early-morning wake-up and the 5-hour flight. Our guide will pick us up at 8 am tomorrow for a scheduled 4-hour tour then we will be on our own for the afternoon. At this point . . . all I can say is good-night. Mary Please tell Stan I am sorry about his plane trip-bouncing in the air can be creepy! Other than the smog, Lima sounds fascinating! Can't wait to read more this week. By the way, did you see on FB where a small potbellied pig showed up today at our house? Our neighbors across the street are acting as surrogates as we try to locate the owners, but I am afraid they have fallen in love with her!